This was another of those occasions that confirmed how much more comfortable life is under Kenny Dalglish, Liverpool succeeding where they failed last year by overcoming lower-league opposition to progress to the next round of the Carling Cup with the minimum of fuss. Daniel Nardiello scored a late penalty for Exeter but Liverpool were strolling by that stage following an outstanding display by Luis Suárez, who left the pitch to applause from all sides of the ground. The contrast with their humiliating defeat in the same competition against Northampton Town at Anfield 11 months ago was stark, as Liverpool ruthlessly punished their League One opponents in the first hour of an entertaining contest. Exeter, to their credit, never surrendered, but with Suárez shimmering with menace whenever he picked up the ball, Liverpool simply had too much class. That the Uruguayan was so motivated on a wet evening in Exeter in front of 8,000 spectators was even more impressive. He grabbed the first – his third in as many appearances this season – set up the second for Maxi Rodríguez and wasinvolved in the third, which was scored by Andy Carroll, who came on as an early replacement for Raul Meireles. Liverpool looked like they might cut loose after Carroll’s goal but instead they eased off and allowed Exeter to come back into the game then grab a belated reward for their efforts when Nardiello beat Pepe Reina from the spot after he was upended by Martin Skrtel. Although Dalglish made eight changes from the side that started against Arsenal on Saturday and named three teenagers in the defence, there was plenty of experience elsewhere in his line-up, underlining the significance the Liverpool manager has attached to the competition. “We said before the game that we would make changes but we also said that in no way should that be taken as being disrespectful to Exeter or the Carling Cup,” Dalglish said. The only sour note for Liverpool was the injury to Meireles, who has damaged his collarbone and will be out for “a few weeks”. He fell awkwardly following a robust but fair challenge from Danny Coles, and was unable to continue. 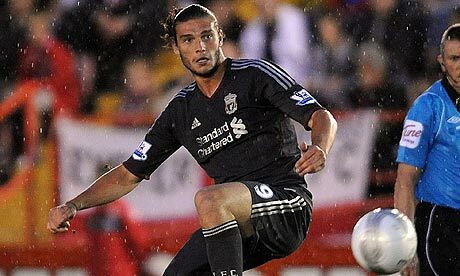 Carroll’s subsequent arrival merely served to emphasise the gulf between the two clubs. Liverpool spent £35m on the England striker; Paul Tisdale, the Exeter manager, has only ever paid one fee for a player, Troy Archibald-Henville, and that was £50,000. Liverpool took the lead when Jordan Henderson, who was booked for diving in the second half, delivered a centre from the right that Artur Krysiak got his hand to but was unable to clear. Suárez was perfectly positioned to pick up the loose ball, firing a crisp, angled volley from eight yards beyond the Exeter keeper. The game was effectively put beyond Exeter when Liverpool scored twice in three minutes shortly after the interval. Suárez’s square pass allowed Rodríguez to tap home and more fine approach work from the forward culminated in the ball eventually dropping for Carroll to rifle home what was only his third Liverpool goal in 12 appearances. Dalglish spoke of his delight that Carroll was off the mark this season, but it was Suárez who left a lasting impression on the capacity crowd. “He doesn’t give many bad performances,” said Dalglish.